One of the few comforts of modern living is that, at any given moment, we mostly know where Johnny Depp is going to be. (On a movie set, usually, or in the company of The Hollywood Vampires.) (Johnny Depp is in a band with Alice Cooper, called The Hollywood Vampires.) But sometimes Depp slips the net, for good or ill, producing the occasional heartwarming hospital visit, or a plot to flood Australia with blatantly illegal dogs. This week, Depp went briefly off the grid with the help of his friends at Disney, for a promotional prank based around his upcoming appearance in Alice Through The Looking Glass. The company set up one of those video billboard displays—the ones that cycle through a series of still images and movie posters with actors’ faces emblazoned on them—at its Anaheim Disneyland Resort. 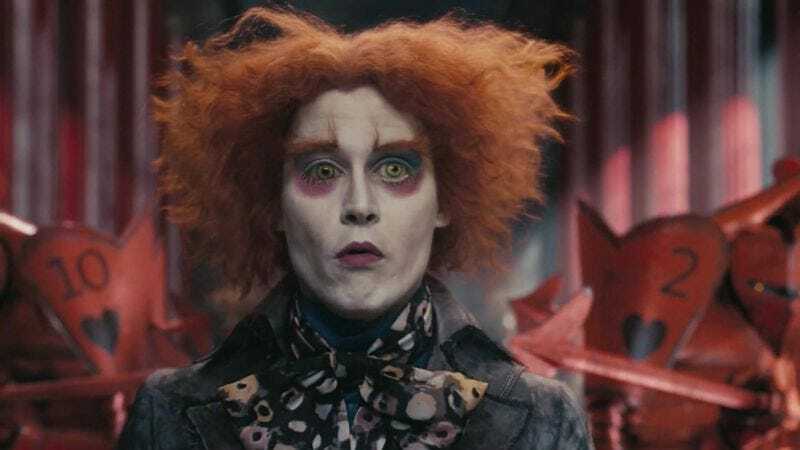 Occasionally, Depp’s Mad Hatter would come up on the screen, along with pictures of Sacha Baron Cohen and Helena Bonham Carter. Except, in Depp’s case, the image being projected wasn’t a still picture, but a live video feed of him, in costume, with a camera watching the people in the park.